I feel like I should start this blog post with a bit of a disclaimer. Everything I am going to talk about here is my personal opinion. If you disagree with that, then fine. I hope you stay to listen to what I talk about at least. While I’ve been concentrating on Bonjour, Blogger!, I wasn’t blogging (Yeah, you know this already) but I was (obviously) still getting my email. One of the things I noticed most was that while the offers to review products, etc were a bit less than usual (and what I was getting offered, I turned down because I didn’t think it was fair to accept while I was being so lazy with ceriselle.org), I was receiving a larger than normal amount of sponsored post requests. Sponsored posts. They’ve never really been something I’ve been comfortable with. I thought I was doing it the “better” way when I would ask to write things myself – “it’s still my voice!” but I still felt a bit icky when publishing them and then seeing them again in my feed reader. I was invited to a dinner recently in Bristol with the Collective Bias team, to talk all things blogging, and to be introduced to how they work. (I’ve covered the main points over on BB if you’re interested). The thing I found most interesting (besides that they think bloggers in the UK are totally underselling themselves, and from my own research, I know that’s true!) was that they weren’t working on the basis that most brand relationships over here do, where you’re sent a product and asked to include specific links with specific words, but instead they ask a blogger to go and buy the product, share the shopping experience and – this is the part that I like most – post about the product with nofollow links. They’re interested in getting your *review*, not some boost in the Google rankings for that product. With BB, I am trying to provide information that is – or should be – best practice for bloggers. In my sponsored posts survey, it was surprising to me how many people didn’t know what a nofollow link. (Here’s that post as well) In extremely basic terms, a nofollow link is where if you receive payment or product for a post/link, you should mark it as nofollow so search engines are not influenced by that paid placement. So I’m done. I’ll be happy to review products, but they’ll be posted with a nofollow link. I will not publish or produce any more posts with sponsored links in. That’s my choice. If this makes you think about what you do, then awesome. If it doesn’t, then that’s fine too. Now, who fancies a cup of tea? 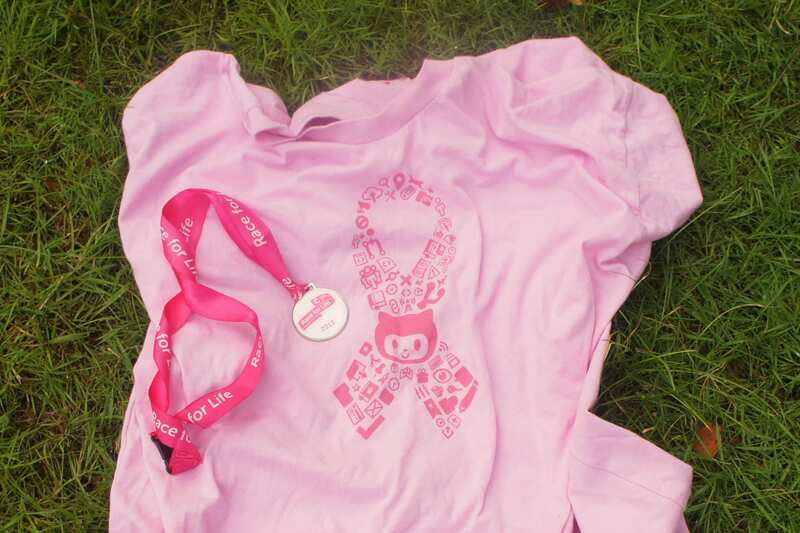 So, my 6th Race for Life, and my second 10k. When I signed up for it, I had high hopes that I would be able to – well, not run all the way, but at least complete the race in a reasonable time. I am definitely a lot fitter than I was last year and I was training at least 5 days a week on my cross trainer. But things never go to plan, do they? About a month before the race, I started having twinges in my back – nothing serious at first, but by the end of that week, I couldn’t even walk properly or sit down at work. I ended up taking a week off work, lying on the floor most of the time which was a pretty miserable week. I would take enough pain killers so I could sit up for a few hours and crank out a few BB posts, then retreat to the floor to watch TV. A few doctors visits later, and I have painkillers that make me queasy and forgetful, but at least I can walk now. Anyway. Excuses out the way. The day of the race came, and after buying two pairs of shorts (because I left one on the bus the night before the race – see, forgetful), I headed up to the Downs and took part in the 10k on one of the hottest days of the year. I was also wearing a Github Pinktocat which raises money for Breast Cancer Awareness in the US (thanks Alex!) and some pretty gloriously flourescent trainers which I’ll talk about a bit more later. I jogged for the first few kilometers, but around 2.5km, I started to get a pain in my back. I had a stash of painkillers in my pouch, so took a dose and carried on, a little bit slower. Unfortunatly by around 4km, the pain was just getting too much and I ended up (speed) walking the rest of the way. I was so gutted that I couldn’t manage the whole race but I managed to complete it in about 1hr 20mins. A few months ago, I had a very kind email saying “We saw that you’re going to be doing Race for Life, would you like to review a pair of running shoes?” I had been thinking of buying a new pair for the race, but hadn’t gotten round to it, so this was perfectly timed. 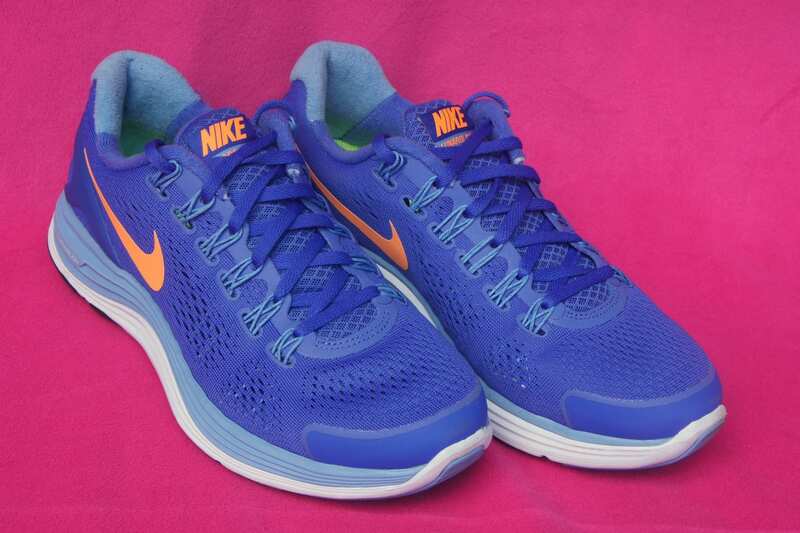 I chose the Nike Lady LunarGlide+ 4 because they have the Nike+ technology ability, and I already had the chip from my old pair of trainers. (I’ve already blogged about how digital metrics can help motivate me!) The trainers have been so comfortable and supportive, I hadn’t realised what bad shape my old pair were in! You do something, and you do it on a regular basis, and it’s almost easy when you do it so often. But then you get excited about a new project and a few days off your regular thing turns into a few weeks and then it’s just daunting to get back into it. Sorry blog. I’ve abandoned you for Bonjour, Blogger!. It’s kinda ironic I guess, I’m telling people how great blogging is, and I’m not doing it myself. This week though, I’ve wanted to tell you about how I did with Race for Life, and show you my dress from the beautiful wedding we went to on Saturday, and tell you about the cake sale we had last week. While I’m mentioning Bonjour, Blogger!, then if you’re interested in taking part in the weekly blogger interviews, do drop me an email at hi (at) bonjourblogger.com – I love reading everyones replies! To make it up to you, here’s a video of Fern and how exactly she carries around that giant tennis ball you see so often.